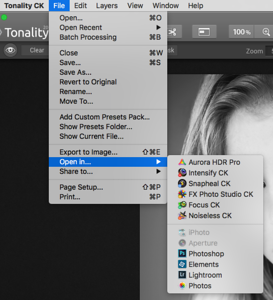 Tonality CK - by Macphun is for BW conversion and can be bought as a standalone app or as part of 'Creative Kit' which is only for Mac users (sorry Windows users). 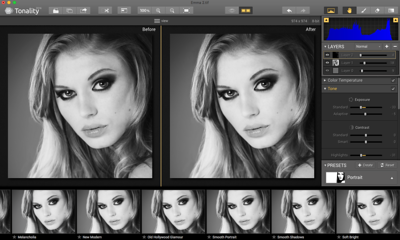 The interface is simple and uncluttered and should appeal to casual users and more experienced photo-editors as an alternative to Nik and/or Adobe software and is fully compatible with PhotoShop and Lightroom with a straight forward plug-in install. 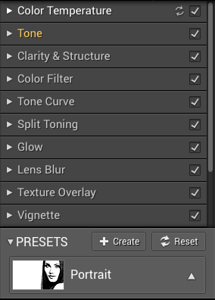 For me a lot of the supplied presets are - not unlike the Nik Collection - a little heavy handed, but with detailed controls and the ability to use masks and layers it can be finessed, and may be a useful addition to your workflow or can be simply used to add instant impact to images. I'll add a more detailed review soon. 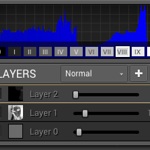 A detail from the layers palette and a 'zone system' indication on the histogram are great additions. Showing an easily created luminosity mask which can be edited with custom brushes. 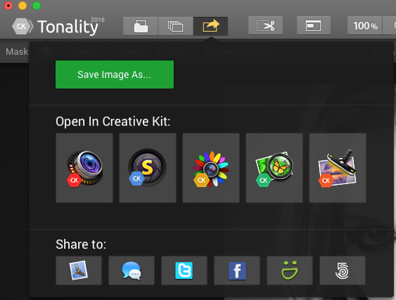 Images can be opened and easily shared throughout the Creative Kit and other applications. Batch processing is possible - another great addition. Stable plug-ins for Adobe products are simply laid out and are easy to access and instal. This seems to one thing in particular that polarises opinion and confuses people in equal measure. So what does it mean in practise? When shooting in RAW (and in my opinion we should most of the time) the histogram is your best friend to help you determine how you are exposing your shot. If you use this technique you must ignore the LCD display - this is where people can become confused. remember the LCD displays a thumbnail of the jpeg from the RAW file. It can be used to check sharpness, composition, facial expressions and a few other things when necessary, but not to check exposure. 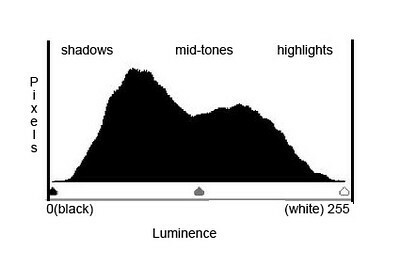 The histogram will give you all the information you'll ever need and by exposing and pushing the histogram to the right - as far as possible without overexposing or clipping your highlights - you'll have the best quality file with the least possible noise in the shadow areas when you process your image. The image may appear very bright on the LCD, but you'll now the best digital negative and the first thing you do when processing in Adobe Camera Raw or Lightroom is to pull back the exposure slider before you continue to process as normal. Sharpening digital images is something that people sometimes get wrong and confused about. All digital image files, whether from a digital camera or scanned film are 'soft' (not unsharp) and require sharpening to add contrast - normally on the subject edges - to make them appear sharper. Indeed, most software, even with sharpening set to zero will still apply a level of sharpening to help make your shots look better on first looking at them. There are many different ways and methods of doing this and some very good software packages and plug-ins to help you - and people with much bigger brains than me have written volumes about the technical details. Martin Evening and Jeff Shewe, to name a few, have written excellently on this. If you want to know more about this kind of detail I suggest you dig into some of their books. Bear in mind that sharpening is a subjective art and will depend on the image, its intended use, whether it's to be printed, what paper is to be used and at what size, or if it's to be viewed on screen. It can be overdone and edge halos can start to appear and/or the image can start to look 'artificial' and 'coarse'. Some photographers will have different opinions on how much and which method to use. I almost always sharpen images in 3 stages - Input Sharpening, Cosmetic Sharpening and Output Sharpening as part of my digital workflow. Input Sharpening is a level of sharpening I apply when importing my Raw files. This can be the Adobe Camera Raw or Lightroom defaults which will apply a small amount of sharpening to help your images look crisper for viewing and further editing (as you become more experienced at this you can create your own defaults to apply to different kinds and styles of shots). Cosmetic Sharpening is my next step. Again this is image dependent but if required I may further sharpen some areas of a shot. 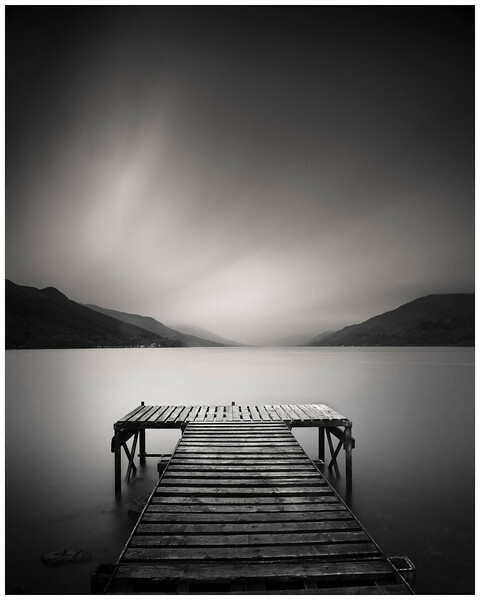 I use a variety of methods at this stage which can include High Pass, Luminousity Masks, Smart Sharpen, and others - the important thing is to find what works for you and your images. Output Sharpening is my final step - when another level of sharpening may be added depending on how the image is to be used and at what size. Just remember to preserve your Raw File and employ non-destructive techniques through all these steps - as you'll need to apply output sharpening at different levels for different uses. You may want to re-edit or apply different sharpening methods to your original files in the future. Also, what may sometimes look 'over-sharpened' on screen may result in a beautiful looking print - experimentation is the key. Apart from your skills and technique - a great way to come back with super shots is to carefully consider you location and when you should be there. http://www.tidetimes.org.uk/ - check when the tides will be right - don't take any chances! The Photographer's Ephemeris is a great tool to help you plan your shoot and is available for most Smart Phones and the iPad. http://www.photoplaces.co.uk/ is newish web-site for photographers to share locations and ideas - a lot of the info is, at present, English based but I'm sure this will be added to. Remember that you don't have to go 'location bagging' and visit all the places that have been well photographed before. There are many, many fantastic places to be explored - and many of them are on or not far from your own doorstep! 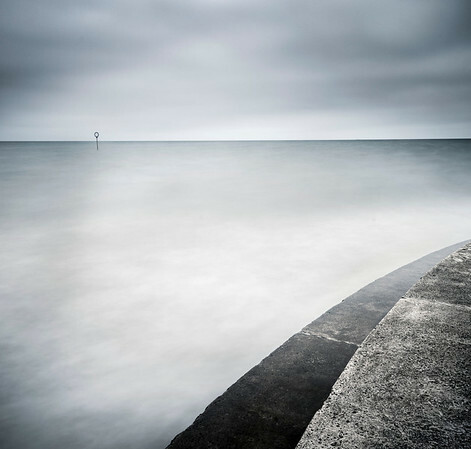 Sometimes a little-explored and unglamorous part of the coast can offer great shots - take your camera and tripod and explore.